Dr. Yazdan is an expert in cosmetic dentistry in Orange County taking pride in offering the finest in patient care and services to each and every patient individually. At her offices in Newport Beach, CA she is determined to give you the smile you’ve always desired. 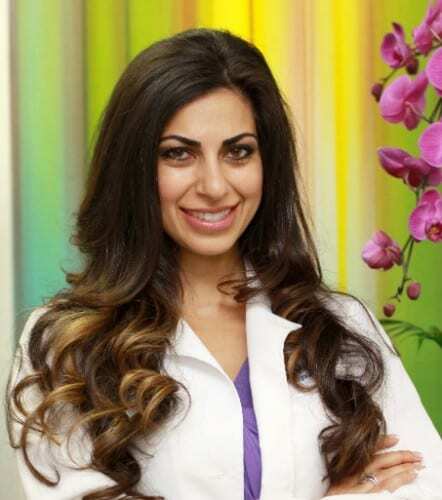 Dr. Yazdan’s passion for her smile makeovers began when she was very young. Dr. Yazdan was born with severely misaligned teeth. My teeth were the first thing people noticed, and I was constantly embarrassed by them. After having braces 3 times, and many terrifying dental experiences, she became intrigued with the dental field. I wanted to make sure that none of my patients would ever live through the experiences I had during my dental visits. My experiences motivated me to create perfect smiles, and still be extremely compassionate towards my patients. Dr. Yazdan soon began focusing her education on helping people achieve beautiful smiles. Dr. Yazdan’s expert training and professionalism have added to her keen eye for beauty. At the Center for Restorative & Cosmetic Dentistry, Dr. Yazdan utilizes her expertise and passion to create your smile transformation. Bonding is a restorative procedure for teeth that are chipped, cracked, discolored or disarranged. Dr. Yazdan will lightly etch the surface of the tooth and apply a bonding liquid. A plastic resin is then applied and sculpted into the desired shape. Bonding can often be completed in a single visit and can significantly change the appearance of your smile. However, plastic resin is not as strong as tooth enamel and is more likely to stain, chip or break than natural teeth. Veneers are a more long lasting solution for chips and gaps. Dental bonding is considered a direct technique toward improving your smile. Tooth bonding is designed to restore the natural appearance of teeth, such as correcting gaps, cover spots, chips, and discolorations. If your condition applies, it may also help to repair fractures and re-shape teeth. This procedure typically only takes about one visit with Dr. Yazdan, in which she will roughen the area that needs to be repaired, etch the tooth with gel, and apply a treatment of bonding primers and tooth-colored composite resin. To know if you qualify as a candidate for dental bonding, make an appointment with Dr. Yazdan in Newport Beach. With her expertise in the area of cosmetic dentistry, patients are known to walk out the doors with much more confidence and a brighter smile to show off to the world.